The summer season was a blur. It has gone so fast, I almost didn’t feel it. June is the official start of the rainy season, and it welcomed us over our trip to Bulalacao, Mindoro. I knew I was going to like Bulalacao the moment we stepped into its port despite the gloomy weather that day. It was just a knowing feeling, similar to the one I had in Catanduanes. Writing this recently after our trip, I can say that Bulalacao gave me one of the best island hopping experiences I’ve had here in the Philippines. 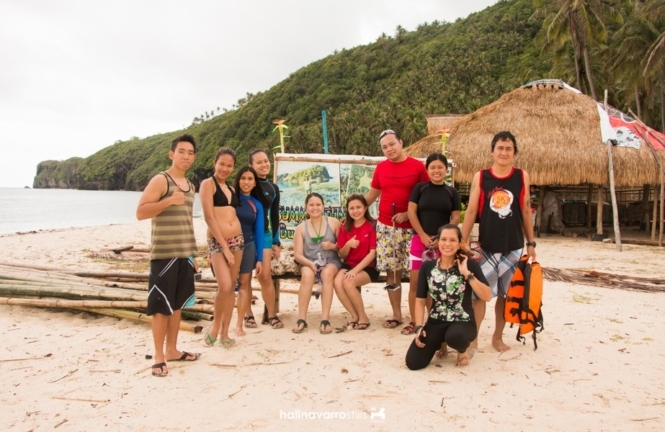 Read on about our island hopping experience in Bulalacao. 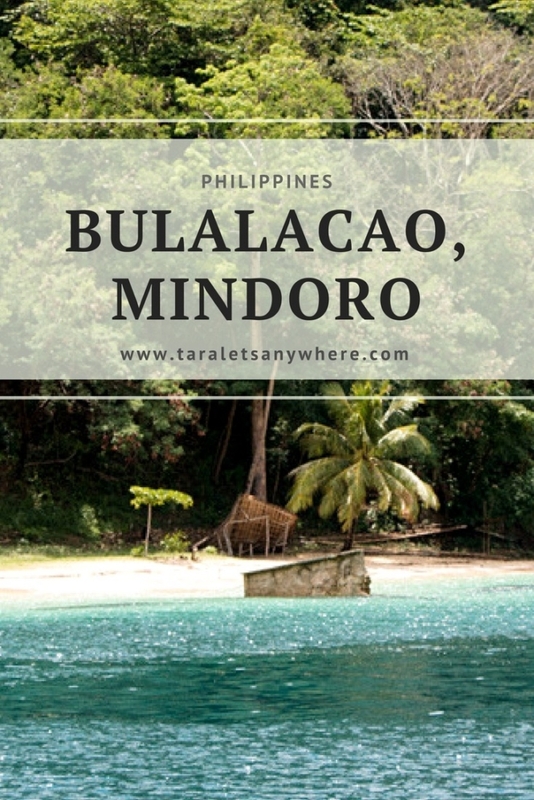 We also included our travel guide to Bulalacao, Mindoro. It was a long weekend, but the weather wasn’t agreeable. An LPA has just landed in the country. There were no cancellations from the tourism office, however, so we pushed through. It was dark and rainy when we landed in Bulalacao. Our boat managed to get us across from the port to Tambaron Green Beach Resort where we’d be staying the night, but island hopping was postponed. It was almost a staycation. Almost, since it wasn’t the plan and we were too anxious of being stranded. There were strong rains during our first day. Still, I can say that Tambaron Green Beach Resort is one of the nicest beach resorts I’d been to. The reviews in TripAdvisor got this right. The resort is located in a small beach cove with calming green water. In the late afternoon, the water recedes and you can pick up clams and shells fresh for eating, even sea cucumbers. The resort has family rooms and open cottages for guests to stay at. There are hammocks alongside the shore. It was nice to just read an e-book or sleep or play a game on the mobile (but yes, I should’ve helped with the cooking). On our second day, the sea was already calmer. We took off at about 9 in the morning to go island hopping. 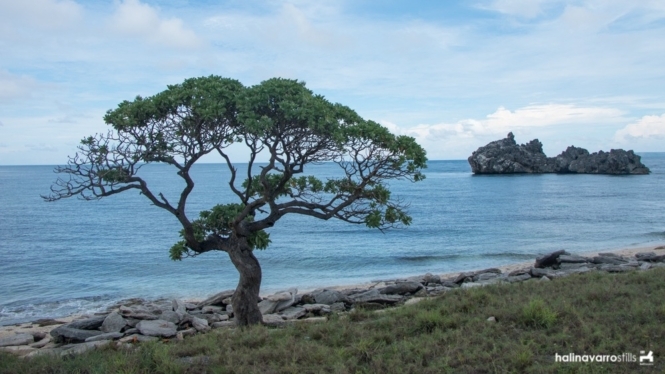 Buyayao Island is a quiet island in the south. It features a dark-emerald beach, which is undoubtedly one of the clearest I’ve seen. It reminded me of the islands in the province of Dinagat Islands. 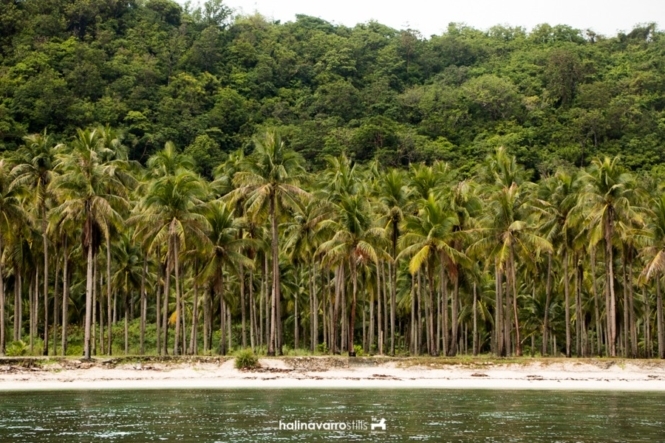 The shore is lined with coconut trees and bamboo cottages. I think Buyayao Island is a great place to spend a night in. It’s beautiful and not commercialized, but well managed. Aside from the cottages, there’s a small sari-sari store in the island and cooking utensils for rent. The beach is beautiful and you can snorkel far from the shore, although current here is strong. After our stop at Buyayao Island, I was deeply underwhelmed with Suguicay Island. 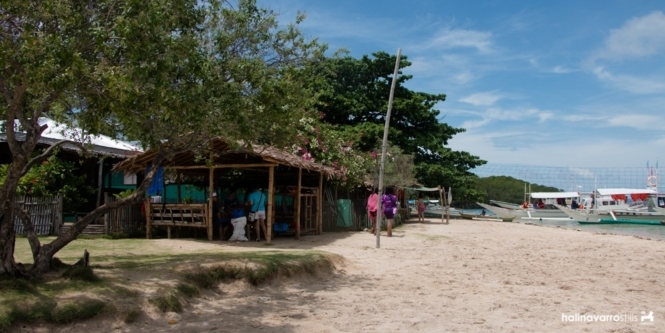 Suguicay Island is a family-managed beach resort. This is the most commercialized island we’d visited in Bulalacao, and you can tell from the number of visiting families that it’s a go-to beach resort. There’s a lot more cottages here and floating ones as well. There are stores and a volleyball net was setup in the middle. The water is blurry though and filled with floating sea plants and pieces of small trash. It wasn’t that bad, but it’ll certainly benefit from more clean-ups. There’s a sand bar at the end of Suguicay Island, which seems a more inviting part of the island for a visit. Our boat couldn’t come close though because of the low tide. I’m not sure what’s the story behind Target Island, but it seems to be a recreational project abandoned sometime in its development. It’s like a nature theme park without all the crazy marketing gimmicks. We had a really good time here. Target Island has a few beach coves. At one end we found a stair that goes up and around a small mountain. One route will take you to some nice ocean views, and the other goes at the back of the mountain where you can have an overlooking view of a small (man-made?) 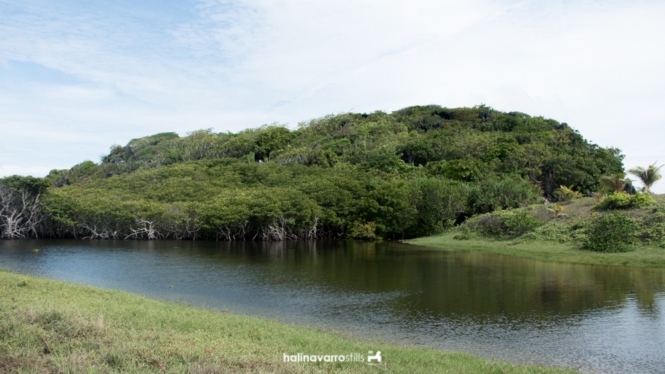 lake surrounded by mangroves. The trails don’t seem to be visited often. There was a route where we literally had to push aside overgrown branches from plants. 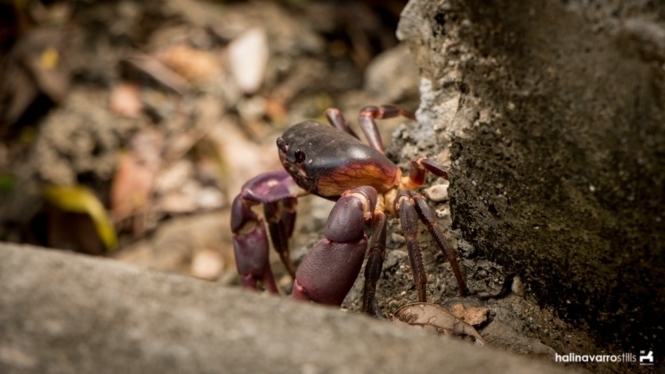 We saw at least three black-violet crabs on the trail. We ended up near the lake. From afar, we saw the cliffs beside which was our boat. The houses atop look like a miniature castle from this viewpoint. We walked toward the houses. Beside them, there’s another cove with clear light-green water and one or two small cliffs where you can dive from. I liked swimming here better than the rest of the islands we’d visited in Bulalacao because the water temperature is the right cool and current is minimal, perfect for modest swimmers like me. 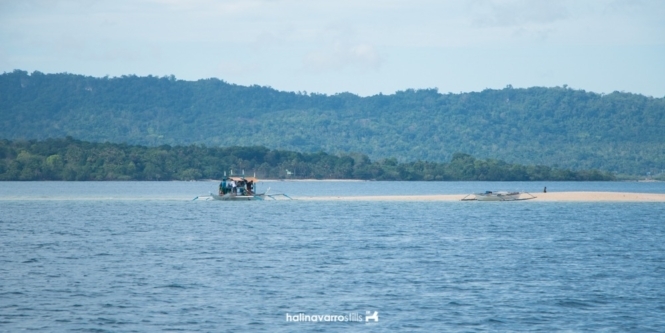 Aslom Island is known for its long sand bar. It was high tide when we reached Aslom Island, so the sand bar wasn’t visible. In a way it’s good luck because we had time to discover its underwater treasures. 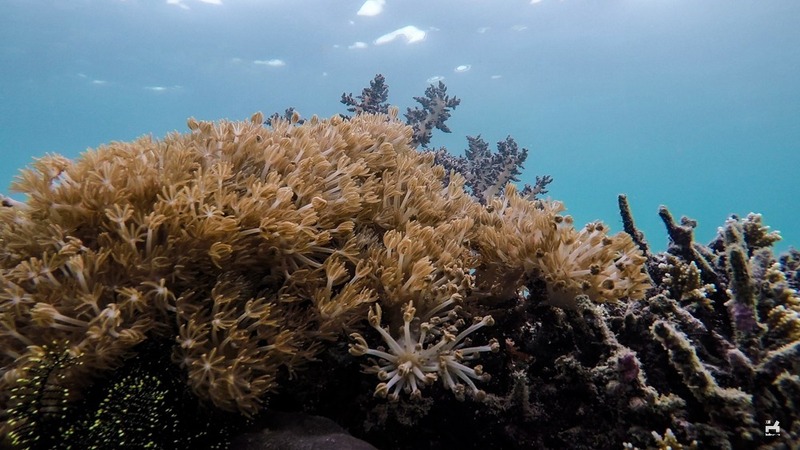 What we didn’t know — and what other tourists seem to be miss out on — is that Aslom Island has really nice snorkeling areas. 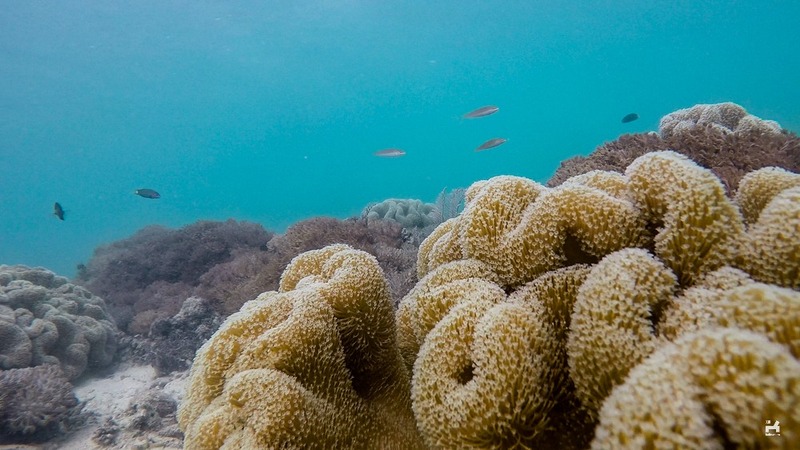 Just about 2-3 meters from the shore, we already saw clumps of big soft corals and schools of small fishes. 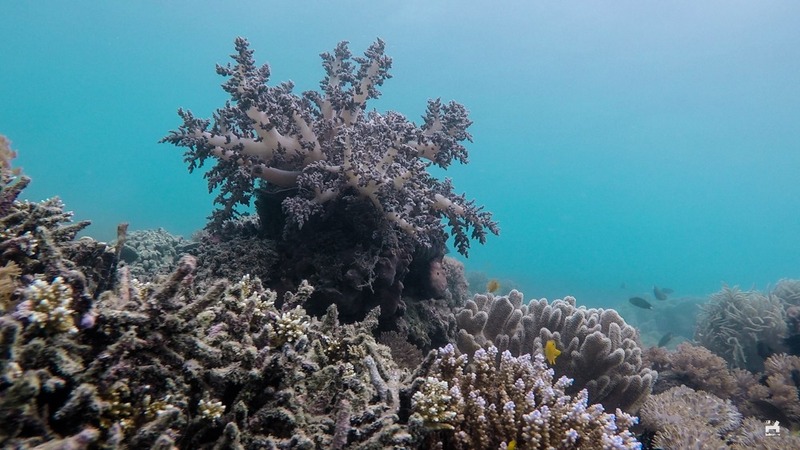 I was elated and reminded of a similar experience in Apo Island. I was bothered that boats navigate and dock on this side of the island. Some corals close to shore looked somewhat damaged. Our boat’s anchor landed on some poor coral. 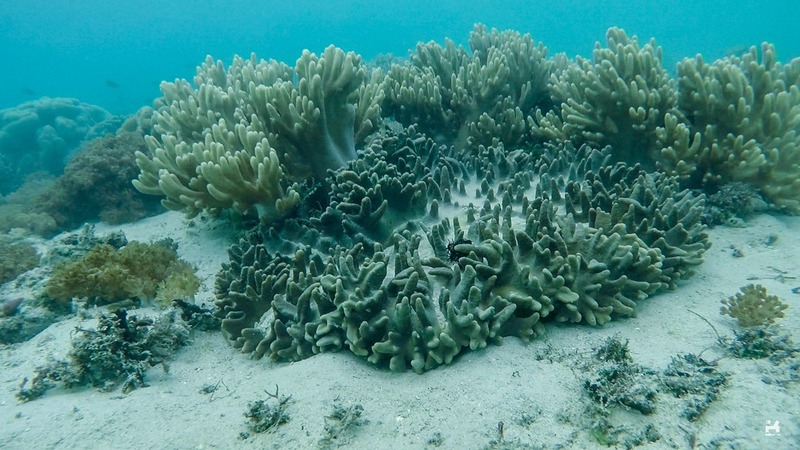 A few of us inadvertently stepped on some soft corals before we realized what they are. 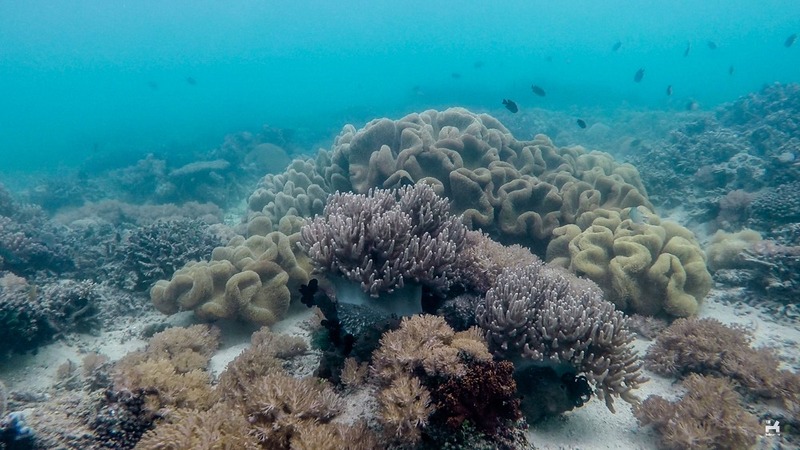 I hope the local tourism does something to protect this underwater garden. Bulalacao is a municipality in Oriental Mindoro. It’s a faint shadow alongside the popular summer destinations Puerto Galera and Apo Reef. Most people don’t know about it or if they do, they aren’t aware of what it offers. 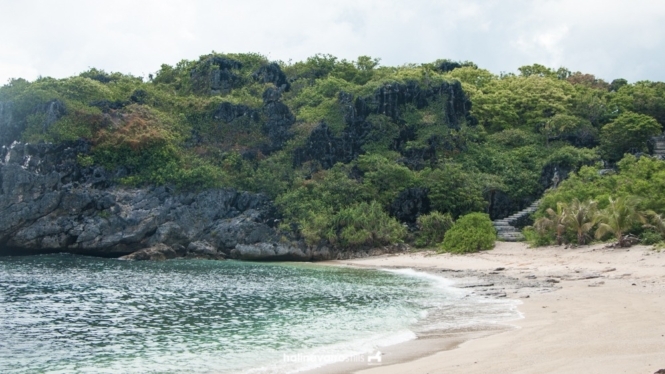 Bulalacao has beautiful untapped islands and several waterfalls to explore. There are proper accommodations to make families comfortable. There are also huts and tent space for young people. 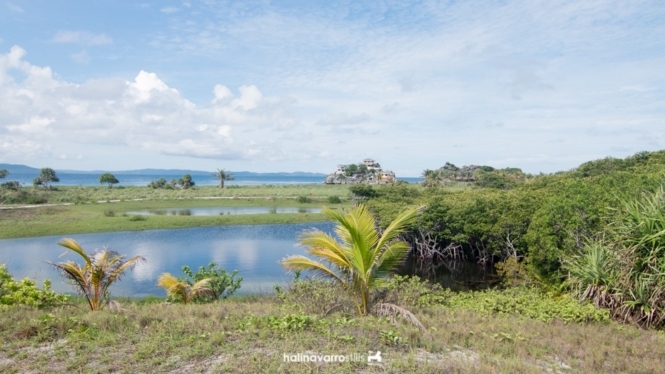 Bulalacao offers adventure or opportunity for some quiet alone time, whatever it is you’re looking for. There are different ways to get to Bulalacao, Mindoro. 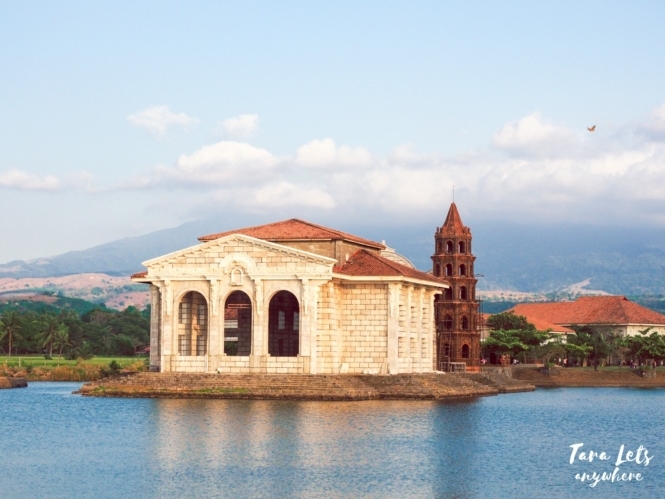 Take a local flight to to San Jose, Occidental Mindoro. Ride a van that will take you directly to Bulalacao. From Manila: ride a bus to Batangas pier (P130-170) and then hop on a ferry en route to Calapan (P220-240). From the port of Calapan, ride a van directly to Bulalacao (P250). If there are no vans waiting in the port, ride (a) a tricycle to bayan or (b) a van to Roxas and then transfer to a van to Bulalacao. There are also buses in Alabang (DimpleStar) and Cubao (Alps, Ceres) with a direct route to Bulalacao (P700-800). Bulalacao is also connected to Boracay and Caticlan via ferries. Travel time is 2 hours. 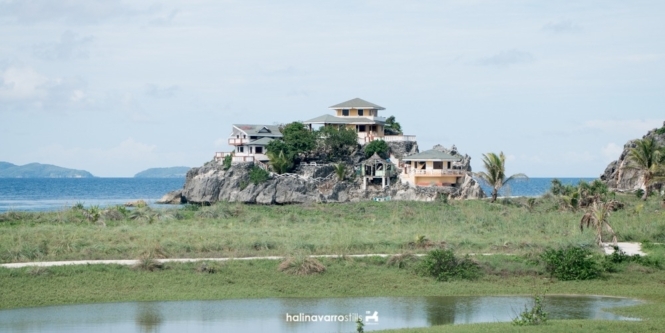 It’s possible to see Bulalacao on a weekend trip. Here’s a sample itinerary. These are the available islands for touring in Bulalacao. It’s best to spread them over 2 days, although ideally you can also visit most of the islands in 1 day if you start early. 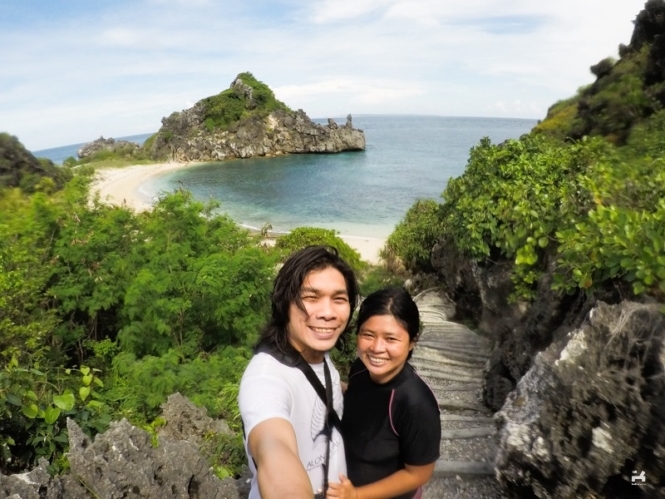 There are no standard rates for island hopping in Bulalacao, Oriental Mindoro. It depends on the size of the boat and islands to visit. We chartered a large boat for P8500 for 2 days to cover both tours. It’s wide and sturdy to make sailing across the bumpy sea comfortable enough. 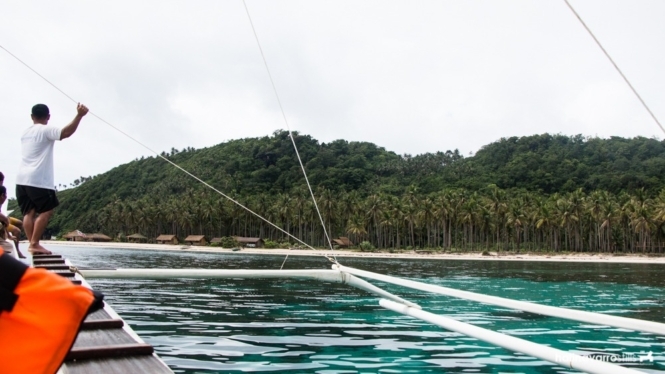 You can charter a narrower boat for the same amount of people for about P6000. If you don’t have prior contacts, you can ask your selected accommodation for referrals or haggle with locals in the area. There are several accommodations available in Bulalacao. You can stay in the mainland or in one of the islands. We stayed in Tambaron Green Beach Resort, which is about 30-40 minutes from the port. As I said above, it’s one of the nicest beach resorts I’d been to. What it lacks in modern amenities, it fills in with charm and quiet ambiance. Tambaron Beach Resort has open cottages and different types of rooms available. Guests have the option to order meals for P250 each or to bring their own food. We rent a family room for P3000. We brought our own food from the market in Bulalacao and paid P500 for using the kitchen facility. Dining utensils can be borrowed for free. If I had seen Buyayao Island first, I would probably have voted to stay here instead. The beach shore is wide and has very clear, green water. Cottages are available for P1000 for 5 people. Guests need to bring their own food. You can ask the caretakers to cook for you. If you’re in a group, a safe budget would be P2500-3000. We spent about P2500-2600 each. Even with a smaller group, you can stay within the same budget since you’ll be renting a smaller boat anyway. 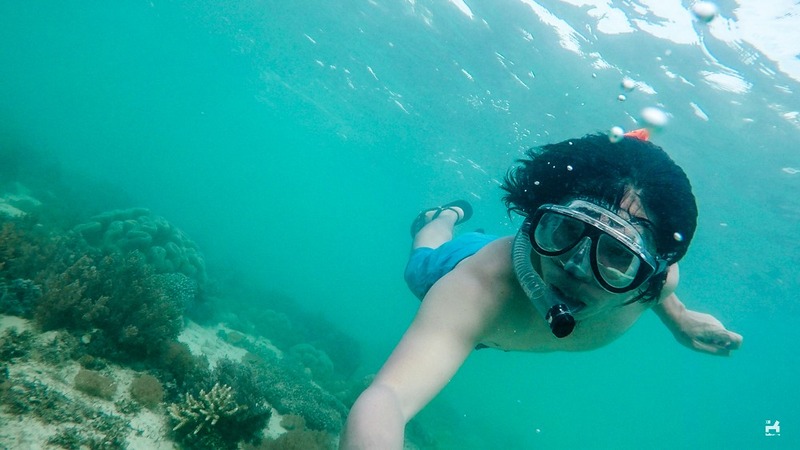 Share this travel guide to Bulalacao to friends who’d be interested! If you have any questions, post them below. If you like this post, make sure to save it in Pinterest! Hi Katherine, when you return to Bulalacao, please try to visit Balatasan. It is a barangay wherein it is sandwiched between two beaches, although you can only swim on one part of the beach. Please try to look at google maps. Thank you for your recommendation! Do you live there? Hi. interesting post. 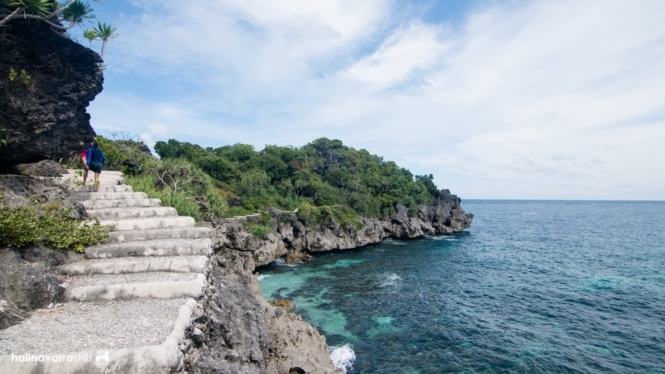 from your trip, have you noticed or known a place for trekking/hiking in Bulalacao? am i correct to assume from your picture that Target island could have at least a small trek activity? Is there accommodation on that island? Hi Terry, I’m not sure the one in Target Island is classified as a mountain – it’s probably a cliff or hill. 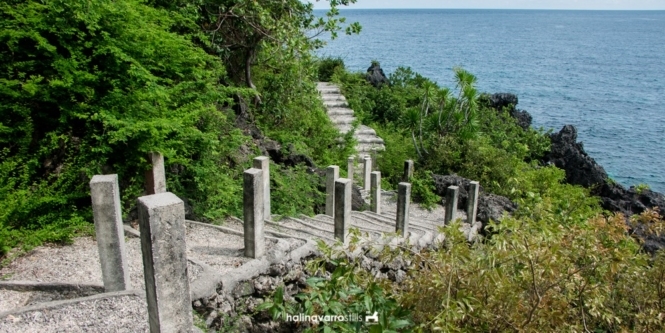 There are, however, mountains for trekking in Mindoro – including Mt. Malasimbo, Mt. Halcon, etc. Wow! Likewise, I didn’t know that Bulalacao has a lot of things to see and discover. The islands you presented are beautiful and picturesque. I kinda hate it though when some people don’t mind stepping on these corals. I agree that the local tourism should do something about it. Hali! Why did you just play games on your mobile phone? LOL! Anyway, i love this write up. Because it’s true that Bulalacao is not yet fully recognized by tourists, and I have not been here yet, and then there you are, gave me an idea for our long list of trips hahaha! Also, thank you for mentioning the prices here. I just wonder how much will it cost us since there will most likely be two of us in this journey. Does smaller boat mean less fees? Re: boats, yes. If there’s just 2 of you it will probably cost P4000 per person.